Duke lost on the road to Florida State 88-72 Tuesday night, and keeping with what now appears to be a nightly routine, guard Grayson Allen drew the ire of a college basketball team’s fan base when yet another one of the junior’s ill-controlled appendages struck yet another human being. 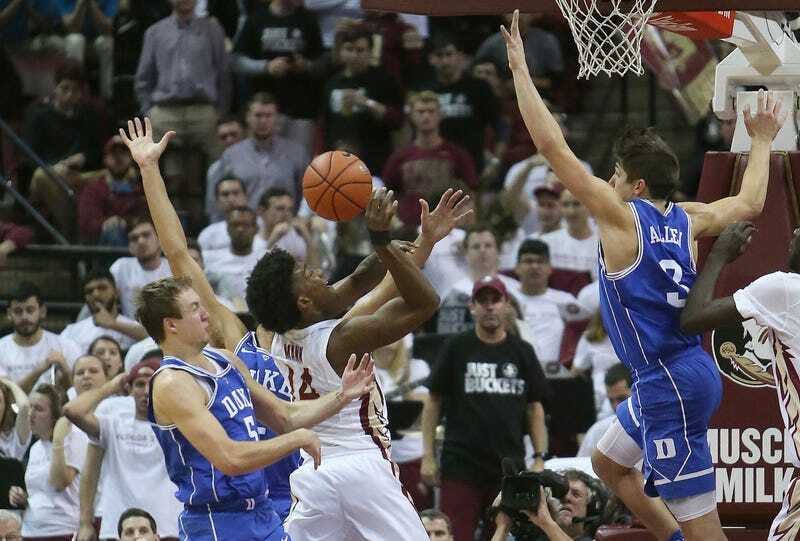 This time, though, Allen switched it up and made use of his arms, which he used to shove Seminole assistant Dennis Gates after diving into the FSU bench for a loose ball. Gates responded to the backlash facing Allen, posting a message in which he took a large part of the blame for not moving out of the way and referred to Allen’s dive-and-shove as a “GREAT HUSTLE PLAY,” claiming the collision of the hips, not the shove, caused him to fall. Allen left the game with 5:36 remaining after sustaining a head injury on the dive, ending the night with nine points, five assists and three rebounds. With do-everything redshirt senior forward Amile Jefferson sitting with a foot injury, the yeoman’s load was carried by Duke guard Luke Kennard, who led all scorers with 23 points, and freshman forward Jayson Tatum, who scored 21 points. The Seminoles, ranked ninth in the nation at 16-1, had four starters in double-digits and made use of a deeper bench to down the No. 7 Blue Devils. If you recall, Florida State’s sharp-shooting guard Xavier Rathan-Mayes was the second victim of Allen’s defective feet—the senior scored a team-high 21 points for the Seminoles last night, telling the press afterwards that he had been looking forward to his rematch with the serial tripper.